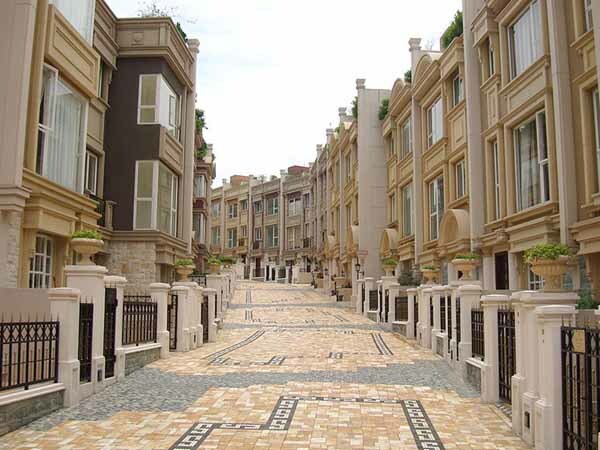 (like row house and brownstone) can be found throughout the world tracing back to Ancient Rome. And as you can see for my example below, its place in the future is secure indeed. I have seen and sold town houses varying from really modest setting to truly fabulous units that would be much grander than many of the houses around. In my mind it offers the best what a detached home can offer you including the direct access to the street, with nobody above or below you – so you do have a little piece of dirt to plant some flowers in the spring and fire up your grill to have some hot dogs on the 4th of July. My first property was a town home and, as it happens with all “first love,” I still miss it! 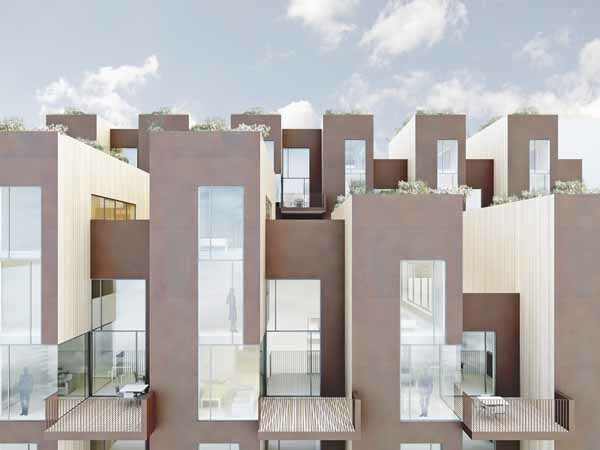 Town home is a hybrid concept between a single home and a condominium and. as such, it will at times present similarities to a single home and in many other instances it will look more like a condo. Direct street access is one of the traits a TH shares with single homes. You have that open street feel that a condo will definitely lack. Shared lateral wall – in a town home living you will have at least one common wall with the neighbors, if you are smart or lucky to get an end unit. Multi -level – the concept of town homes is to have more living space than a condo, but with a smaller foot print than a detached home. No built up - It is an individual footprint: you have exclusive access to the land below you and there will be nobody living above you. CCRs – as a PUD - planed unit development community, town house are required to have its covenants, conditions and restriction. I like to point out to my buyers that town homes use can be as restrict as condominium because in most practical ways it is a condo. In a town house, you own it all and typically hold title to the land where the home has its footprint. A town house will also give you access to the ground below it and no one will live above you but the stars. In a condo, you buy only your “living space,” limited by the walls, ceiling and floor. You would also have a claim in a percentage of the exterior and the common areas therefore you can use them. In a condo that slice of ground will be gone and, unless you buy a penthouse, there will be someone above you for a neighbor. Actually these two kinds of dwellings have a lot in common, not in the physical characteristics, mind you, but in the legal structure that allows them to operate. Both their homeowner associations are typically responsible for the upkeep of any common areas, which may include a pool, tennis courts, picnic areas, play grounds and other recreational amenities and community conveniences like walking trails, landscaping and tree removal. However a condo owner's monthly association fee will also cover, building maintenance, sewer, water, pest control, trash collection, doorman or concierge services, exterior property insurance and side walk snow removal. I have seen some condominium building that will include broadband as well. Concierge notwithstanding, a town house owner will pay these later services direct to the providers. I can guarantee it is just a matter of approach on how it handled money wise you will pretty darn close – it is not even worth your time and mine to try to analyze it here. They will both be regulated by the CCRs but in a condominium you would lose that unique address that would give you “direct access to the street” the town home affords you. More often than not, a town house setting will offer a clubhouse, swimming pool and tennis courts. Some will have a gym. You also would benefit from landscape services to the common areas and it might include tree removal. Rarely the HOA fees would cover external maintenance of the units or the roof for that matter, although would have some latitude on the paint color and other architectural details. I saw something on HGTV the other day that is a bit “out of the beaten path:” At least one town home complex in NYC that has a full blown condominium style when it comes to amenities while maintaining the “format” of town house when it comes to the units characteristics like access to the street and no multi dwelling build up. One of the major concerns that I always bring to the front burner when working with buyers who are contemplating buying a town home or, for that matter a condo, is the parking protocol. Naturally a garage would add great comfort (a 2 car garage, even better). I have seen countless situations where the builder has found a way to put a garage either in the front or on the back of the unit. I love those. The next scenario would give you a certain number of “unsigned” spots. Anybody can park at any place at any time - “free for all” approach. Next step up would present you with “assigned” spots – those are a bit better. Those spots are reserved exclusively for your unit to use. The “possession” and “enjoyment” are assigned to you but the parking spots are part of the “common areas” belonging to the association. The next step is still much better – you would have “deeded” spots. That (or those) spot[s] are pieces of real estate that you own. They may be counted along your other square footage. In many places where the “row” faces a busy street or if the off street parking is “competitive” those are coveted slices of real estate. I have not seen many restrictions about pets on the TH complexes. However, as town houses are present across the country, and in fact across the globe, and being structured under CC&Rs, I can imagine that in some place the issue will pop. You want to be proactive about this part of your family :-) as well and get to know how these little being that bring so much joy to our lives will be received in you new neck of the woods. It also starts with the builder that must register and administer it until 75 of the units are sold. At that point a board of directors will be elected and the board will select the officers. The board is usually elected for a period of one year. The same way I pointed out in “subdivision homes” page. Town home CCRs can be more restrict than a subdivision home environment. A word of caution is that when a home owner falls behind in the HOA dues, fines can be imposed and if goes over a certain limit [in Georgia is $2,000) HOA can force that unit to go to foreclosure in order to recover the money. Please do no let that be you! Noise from neighbors through shared walls some times can be a problem especially if you are coming from a single detached home. However if you already have a “condo background” it will not be noticeable. HOA fees and politics, plus CC&R restrictions will be a factor that you will be able to gage more accurately only after you have moved in. Living can be less expensive than a comparable single family home in the area. Often times the location where these complexes are built will offer convenient access to public transportation, restaurants and entertainment. No neighbors above or below: so you enjoy having a little yard to plant some flowers and maybe some home grown tomatoes while the stars are the only neighbors you will ever have above your ceiling. The yard, if it is not fenced yet, you can build one yourself and enjoy an extra level of privacy. Low maintenance lifestyle – town homes area easy to maintain and HOA will upkeep the common areas like pool and clubhouse [where those exist]. In rare occasions the HOA fees may also cover roof repairs and replacement, exterior maintenance, and other expenses. But not all of them do. I would not count on it, if they did, your monthly will be higher to cover the eventual expense. Please read the by-laws and ask to the managing company what is included and you can budget accordingly. Town home may have had its origin in ancient Rome or at least it was one of their prominent dwellings as cities started to grow and land became scarce. It is a viable home style still up to our days all throughout the world as you can see for this beautiful picture they are thriving as you can see by the beautiful Hong Kong development (top of page)designed by HKArchitect. 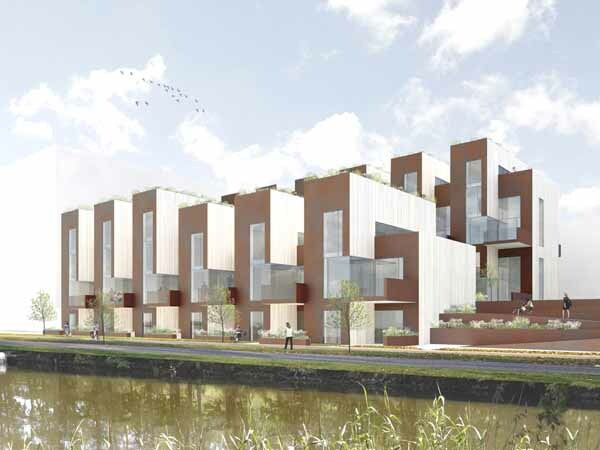 They way these town home are designed, they will be self sustained energy and by 2030 they will use no more fossil fuel. I absolute love all aspect of this design and concept. I wish I could visit and see it myself. “Town home,” “town house, “row house”” or “brownstone” whatever name they came to be called, the ancient Romans would never dream one could fetch so much money for one single unit: Long live the “little” town home!